Awards season is a time in the cinema calendar when we see all of the most anticipated and talked about ‘based on true events’ type films released. Already this season audiences have been treated to The Imitation Game and The Theory Of Everything, both biopics of sorts and both detailing the extraordinary yet somewhat tragic lives of pioneers Alan Turing and Stephen Hawking respectively. Rather than bringing to the big screen a story of a well known figure, Foxcatcher tells a tale inspired by true events that, I, at least had absolutely no knowledge of beforehand. 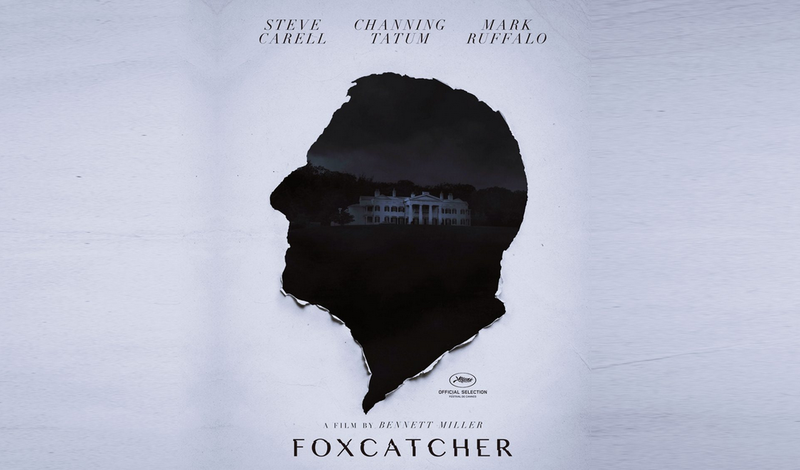 Whether the details of the film’s narrative are more recognised in the United States I do not know, but in essence the only information I held about Foxcatcher upon entering the cinema was that Channing Tatum was a wrestler and that Steve Carell had a mighty prosthetic nose. As I soon came to discover, the film tells the sinister and captivating story of Mark Schultz (Channing Tatum), a gold medal winning Olympic wrestler who strikes up a working partnership with billionaire philanthropist and wrestling enthusiast John du Pont (Steve Carell). Dedicated to setting up a successful wrestling team base at his family’s Foxcatcher farm, du Pont enlists Shultz along with his fellow gold medal winning brother Dave (Mark Ruffalo) and a number of promising young wrestlers to live and train at the facility in order to prepare for upcoming world championships and the 1988 Olympic games. Almost immediately, the filmmakers turn this seemingly ideal set up in to a lesson on how to create quiet threat and dread within a narrative. Very quickly we begin to see that du Pont is a sinister and unstable character, a man with complex psychological issues stemming from various sources including a strained relationship with his mother (Vanessa Redgrave), a bitter disappointment at his own lack of wrestling talent and a sad yet unnerving need to be seen by the young wrestlers as a role model and father figure. Through several disagreements and realisations throughout the progression of the plot, tensions between du Pont, Mark and Dave rise from high to stratospheric and the level of intensity that the film manages to maintain from beginning to end is an exhilarating ride to experience. At just under two hours in length, Foxcatcher is something of a slow burner, and though there are a few lengthy periods of relative inactivity and calm, there is a such a level of threat and dread ever present throughout that it is almost impossible for the audience to lower their guards at any point. One important point to make is that, much like The Blind Side or Field Of Dreams, Foxcatcher is a film that should not be pigeon holed as viewing only for fans of sport. The themes within the picture and eventual shocking consequences of the story are much more applicable and associative with a gripping, edge of the seat thriller than a straight sports movie. Though I am sure certain artistic license has been taken to be able to bring the story to the big screen in a neat two hour package, the film feels authentic and believable throughout and is complex, nerve shredding game of chess from start to finish. The core of Foxcatcher’s believability is a result of the great performances by the film’s three leading actors. Channing Tatum is a pleasant surprise in his most challenging and dramatic role yet, obviously embodying with ease Mark Schultz in a physical sense but also giving a more than credible acting performance given the fact that the character’s range of emotions goes from one of the spectrum to the other throughout the course of the plot. Tatum is often not given the credit that he deserves simply due to his heartthrob looks, but I really do think he is one step ahead of many of the other beef cake actors out there. Mark Ruffalo gives an enigmatic and engaging performance as Dave Schultz, really managing to capture the essence of total respect that the character demands mixed with the strong sense of natural likability that Dave possesses and which so angers John du Pont. The absolute, overpowering star of the show however is Steve Carell as the aforementioned billionaire. In almost unrecognisable prosthetics, Carell is able to shake off any pre existing assumptions of his goofy comedy persona and completely immerses himself in to the one of the creepiest and most sinister characters I have experienced for a number of years. Carell perfects a still kind of menace, on many occasions acting only with his eyes and physical stance but effortlessly portraying the worrying instability and threatening vulnerability of du Pont. The real Mark Schultz has commented that in Carell’s performance it felt as though du Pont had come back to life, and I have not seen a supporting actor performance this year that will threaten to take the Oscar away from Carell at the end of February. Overall, Foxcatcher is a peculiar yet must must see film that is sure to be a contender in most of the major categories this awards season. The film pulls its audience in with the sheer strength and intrigue of the plot, and the wholly captivating and at times terrifying performance by Steve Carell leaves you on the edge of your seat from his first appearance on screen to his last. Please do not be fooled in to thinking that Foxcatcher is a movie made strictly for sports fans, it is so, so much more than that. Great review Amy. I can’t wait to see this, Carell looks tremendously eerie! I don’t know what to think about this film! It seems like such an enigma! Probably means I’ll have to see it for myself. And I definitely agree with you about Channing Tatum being a much better actor than most people give him credit for. Hoping to see this tomorrow night and really looking forward to it. I’ve heard so many good things about it. I haven’t watched the movie yet, but I remember hearing about this portrayal of Schultz being rather inaccurate, especially after Schultz himself took to social media to correct his story: http://www.thewrap.com/foxcatcher-wrestler-mark-schultz-unleashes-tirade-against-director-bennett-miller-a-sickening-and-insulting-lie/ . Nice review, nonetheless.